Animal roundup: scientists have proven that a dog is more likely to steal food if you’re not looking. They’ve invented a robot that can eat anything and excrete the waste. It uses a litter box. The idea is to make it self-sufficient. So far, they’re working on feeding it flies and sewage. “Don’t worry, it won’t eat you,” the scientist said gaily. Hey, it’s early days yet. I’d rather trust a dog. 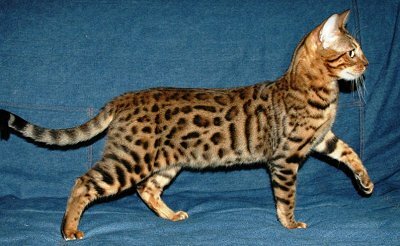 But what I want is a Bengal cat. Not that I want another cat. There’s no room in my apartment or heart, and the other two would be madly jealous. But I want a Bengal the way I used to want Nicole Miller dresses. Pretty, pretty. Also I’d like to able to afford a $1000 cat without blinking. Would I love it more for its touch of the wild? I know: you’re thinking fur coats, fox stoles, conspicuous consumption, blah blah. My mother had a fox stole. It made me think adulthood involved enchanting animals to corpse-stillness like Snow White in her glass coffin. The savage magic of adults when I was five! I look at my mother now and think: where’s the House Goddess; the sneaky witch with her sewing machine, pins glinting on the floor; the Queen of Night with my father wrapped around her little finger (no wonder he was twisted). She’s still beautiful but she’s a human being. What happened? But I was talking about cats. About the cat I’ll get when I’m my mother’s age, Fitzroy and Mouchette are dead, and so are all the Siberian, Indonesian and Indian tigers. I’ll still live in this apartment and I’ll never go outside. My robot will do the shopping (and clean his own litter box). The mad and toxic world will only enter here, through a computer that will be then be everywhere, in the air, on the wing, cleaning your clothes as you wear them, sewing shut your tired eyes. Believe me, dogs know you’re distracted. They slink around like shadows, lift the roast beef so gently and swallow it before you’ve found that special Israeli sea salt. This means they have a theory of mind. I can tell you what it is: If you know your heart’s desire, if you keep your will focused, if you wait with faith and never falter, the human will look away. That Bengal cat is perhaps the most beautiful creature I have ever seen. You are currently reading News of the Day at Mostly in the Afternoon.